I recently volunteered to start making the food for my weekly cribbage league, I wanted to do something different than the soggy sandwiches we were used to having. These little morsels are a party food, snack or with a side salad a very satisfying supper. 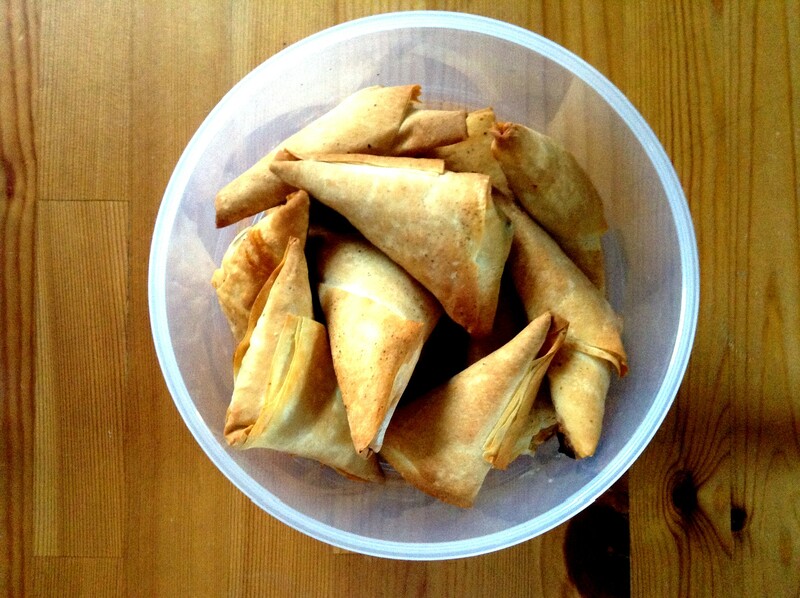 Filo parcels are no new thing, and spinach and feta is quite a classic filling. Because of this there are a range of recipes out there and each one is quite different. I couldn’t be bothered amalgamating all these different recipes, nor could I find one that I liked the look of, so I made it up as I went along and they came out pretty well. Earthy spinach, salty, slightly melted feta and crispy filo, what’s not to like? They’re handheld, a bit crumbly perhaps, but besides that easy to eat no matter where you are. And when they’re warm they’re simply stunning. You could mix in any number of things to amp them up: roasted red peppers, toasted pine nuts, chickpeas. Different combinations for fillings abound as well: peas, goat’s cheese and shallots; butternut squash and feta; carrots, cilantro (coriander) and chilli. The good thing is, anything goes with pastry! For those of you thinking, “Oh…filo though. I’m not sure. It’s so hard to work with.” It’s not really. If I can do it with my sausage fingers and heavy-handed approach, you can too. When I began the filo was quite dry, but surprisingly it was easier to work with then (although very fragile) than after it had been sat under a damp kitchen towel. One of the sheets got too wet and became a crumpled mess when I folded it − needless to say, that one was the taste tester. Some of them exploded in the oven, but I’m not sure if that was over filling or too much moisture left in the filling, or both. I was able to tuck the filling back in and there wasn’t too much overspill of juice to injure the stability of the pastry, so all was well. They were deliciously moist and full of vegetable earthiness and salty cheese. The filling was soft and the shell was crisp. You can’t ask for more than that from a filo parcel. They were a bit fiddly to make, but if you’ve got the time, they’re great for a party. You can fill them and freeze them, so make a double batch and keep them on hand for those surprise guests or those weekdays when you come home only to realize that you have nothing for dinner. They’re full of vegetables and protein as well, so you can give yourself a pat on the back and relax in the knowledge that this butter-laden, cheese filled pastry is good for you. 1. Sauté the spinach in 1 tablespoon of butter until wilted. Season and set aside in a bowl to cool. 2. When spinach is cool, crumble in the feta cheese, add the parsley, cayenne, salt and pepper and mix to combine. 3. 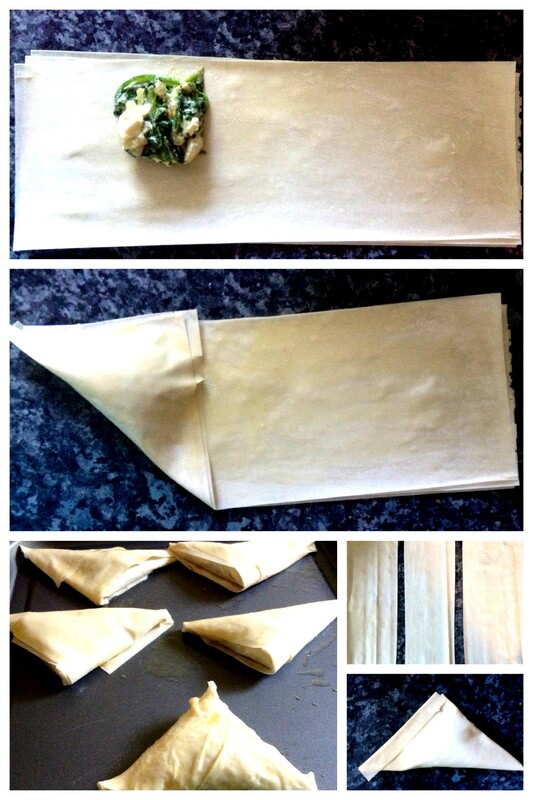 Take a sheet of filo and cut it into three equal strips. 4. Brush the bottom strip of filo with butter, then layer another strip on top and brush that with butter. Layer the third strip on top and brush that with butter. 5. Imagining how you will fold the triangle up, put a tablespoon of filling in the center of what will be the second triangle. Fold the pastry over and press to seal. Then continue to fold up in triangles until you have a neat parcel. Trim any excess if necessary. 6. Place on a baking sheet and brush the whole thing with butter. Repeat with the remaining sheets of filo. 7. Bake at 350ºF (180ºC) for 15 minutes or until brown and crisp. Thanks! Next time I might try squeezing the liquid out of the spinach first before making the filling and see if that stops them exploding in the oven. I don’t want them to be dry inside though, I’d rather have them look a bit ‘rustic’ than be dry! Thanks! I’ve got to try them with some different fillings (and remember to take a picture of the inside once they’re cooked next time). I could eat a dozen of those! Looks quite yummy and the warm cheese and spinach makes my mouth water! Nice job Pami! It tastes like gunge wrapped on crispy pastry!